Open the container manager with the Database → Open Container Manager menu command, or with the tool. Select all rows and delete them. Close the dialog. Open the package manager in maintenance mode with the Database → Open Package Managers → DB Maintenance menu command, or with the tool. Select all rows and delete them. Close the panel. Open the file created in Tutorial 1 with the File → Open menu command (shortcut key Ctrl+O) or the tool. Although not necessary, delete the solution using the Solution → Delete Solution menu command. In production use, set up the metric units as discussed in Tutorial 2 before performing database maintenance operations. 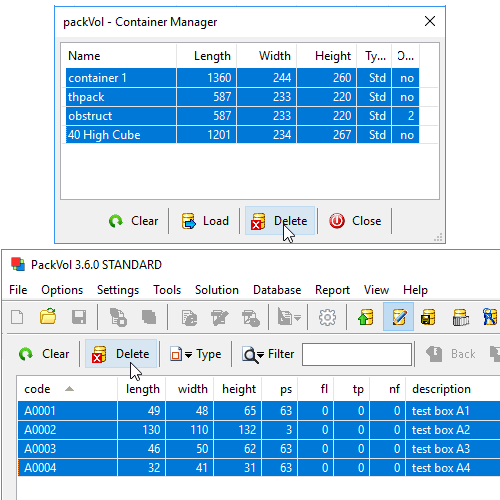 Select the Containers tab, and then the Current panel. Press the Save button and save the container. Select the Packages tab, and then the dimension Dim.. grid. Select all rows (shortcut key Ctrl+A). Save the rows with the Database → Save Items to Database menu command or the tool. You can also use the context menu of the grid [Add rows to database (box) menu command]. Open Database managers as seen in step 1 to verify the correctness of the procedures. Create a new solution with the File → New menu command (shortcut key Ctrl+N) or with the tool. Open the container manager as shown in step 1. 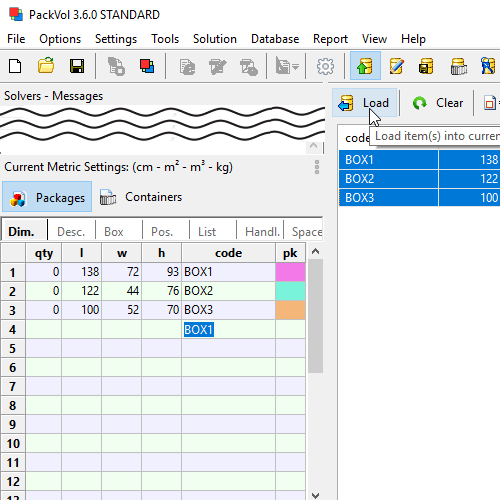 Select the saved container and load it with the Load tool. Close the dialog. Open the package manager in retrieval mode with the Database → Open Package Managers → Data retrieval menu command (shortcut key Ctrl+M), or the tool. Select all rows and load them with the Load tool. For curiosity, edit a code cell by entering a registered code. When the cell is closed, all data is automatically loaded. The auto-completion function can be used to simplify importing from Excel files. The database can be populated with bulk import, using spreadsheet or ODBC table. 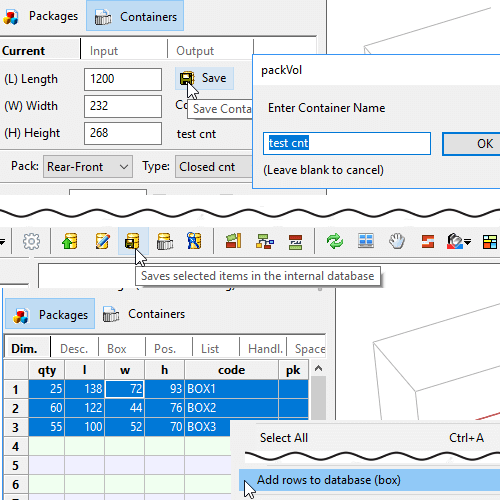 Create an Excel file to import as described in the Tutorial 4. 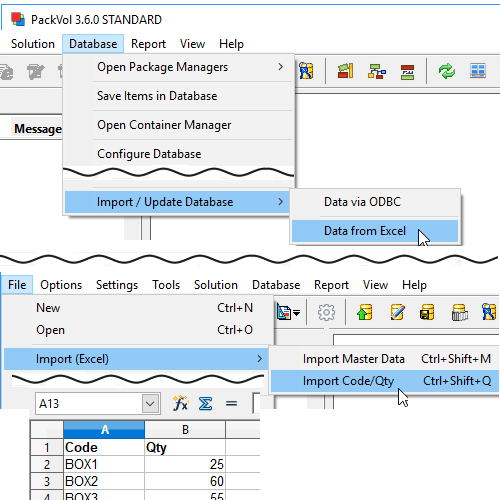 Populate the database with the Database → Import / Update Database → Data from Excel menu command. The load list can be imported by using auto-completion. Create an Excel file with two columns only. In the first enter the code of a record, in the second the quantity. Import the file created with the File → Import (Excel) → Import Code/Qty menu command (shortcut key Ctrl+Shift+Q).